As Qatar’s summer heat sets in, with temperatures hovering around 44C (111F), residents are once again calling for improved conditions in Souq Waqif’s pet area. A recently posted online petition asking authorities to take action to assure animal welfare standards are applied to the shops in the area has garnered nearly 2,000 signatures in the five days since it was published. The pet souq has been the subject of concern and complaints for years, with residents charging that they are being sold animals with falsified vaccination records, and pets who are dehydrated, under-nourished and sick. The new petition is expected to be hand-delivered to the Ministry of Environment’s Animal Resources Department, as well as the Director of Souq Waqif and the Head of Qatar’s Veterinary Licensing department, once it has reached its target of at least 2,500 signatures. “This is a very sensitive issue, and it took me at least a year to summon up the courage to start the Facebook page in November 2012. During a visit to the souq this weekend, Doha News observed one mother lecturing her nine-year-old son against buying a cat there. Many residents have said they feel cheated after buying an animal from the souq. In February for example, Harriet Orlans received a puppy from her fiance, who paid some QR7,000 for a Pomeranian Terrier at the pet souq. Orlans, who named her dog Amir, began to feel suspicious when he refused to be fed the “expensive” dog food that was recommended by the salesman. Amir’s condition worsened the next day after Orlans noticed some blood in his stool. When she took him to the vet, she found out that he had contracted Parvovirus, a common contagious disease among dogs. He suffered a seizure that led to his death four days after he left the souq. His documentation, which was issued by the Vet Life Clinic in Al Aziziya, stated that he had been vaccinated against Parvovirus almost two weeks before Orlans took him home. But Orlans’ vet told her that due to his size, Amir could not have been more than 6 weeks old, and therefore would have been too young to receive the first Parvovirus dose a fortnight previously. Amir’s documentation stated he was older than 6 weeks. Even in the summer months, animal traders at Souq Waqif often keep animals outside their shops in an attempt to attract buyers. At one shop over the weekend, a Shirazi cat sat on display atop a bird cage filled with 10 lovebirds, as a shopkeeper tried to make a sale to one of his customers. In another cage, a rabbit, imported from Egypt, was shaking continuously after the shopkeeper grabbed him by his ears to show him to another potential buyer. “We have number one cats, dogs and rabbits – all in excellent condition!” said the shopkeeper, who declined to share his name. 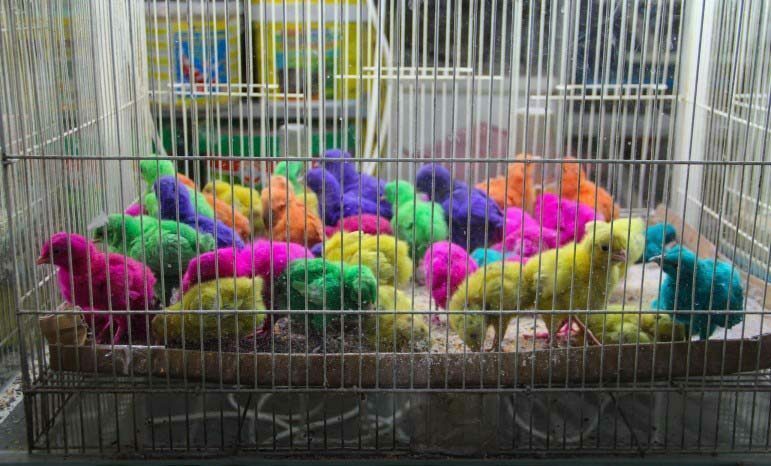 Meanwhile, at nearby Beauty Fish, shopkeeper Mamum, who sells rabbits, turtles, fish and colored chicks, told Doha News that he has to place his pets outside to bring in more customers. He told us that the practice of dying chicks was an “old one,” and that customers enjoyed looking at them. “If a customer’s pet dies, it’s normal because any pet dies,” he said, adding he has not received any complaints from customers. Mamun, however, stated that his pets usually fall sick because they sometimes consume too much water, which subsequently leads him to take them to the souq’s vet. Last Wednesday, Al Raya reported that a significant amount of birds have died due to constant exposure to high summer temperatures and lack of proper care. The vast majority of pets sold in the souq are imported from countries like Egypt, Malaysia, Siberia, Pakistan and Holland. Animals commonly shipped into the country include Shirazi cats, Maltese Egyptian breed dogs, turtles, rabbits, crabs, lobsters, chicks, salamanders, hamsters, parrots, and lovebirds. Some customers have claimed that proof of vaccinations given for the pets are fake. “It makes our diagnosis harder, because if I don’t know where the dog or cat came from, it is harder for me to know what they might have. So I check for persistent symptoms, like passing stool or sneezing, ” she explained. Some of the most common diseases she sees among cats and dogs are Calicivirus, Feline Panleukopenia, Feline Rhinotracheitis, Parvovirus, Canine Distemper, Adenovirus and Parainfluenza. Animal neglect is a crime in Qatar that is punishable through fines and jail time. Mohamed Samir, an Egyptian expat and salesman at Animal Kingdom, told Doha News that Qatar’s Ministry of Environment (MoE) and Ministry of Municipality and Urban Planning (MMUP) make frequent inspections of the area. He added that penalties are usually given to those who violate laws, but none were “serious” enough for the pet souq to shut down or operate differently. “It takes a lot of time for the pets to arrive at the souq – they usually go through all the legal procedures at the airport from being issued passports and permission papers to being transported from the cargo village, all while not having enough food or water for days,” he said.